Santiago is Chile's capital and largest city and has become one of Latin America's most developed metropolitan areas. I invite you to take a look! 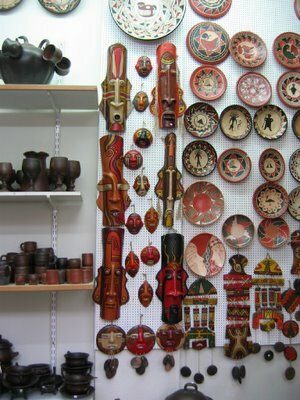 Ceramic pottery is another typical chilean handicraft. It's made of clay and most of these handicrafts are made in Pomaire, a little town located 50 Km west from Santiago. There you can find almost anything you can think of, molded in clay. There are many types of kitchen utensils, like pots and dishes, and other stuff, like flowerpots and souvenirs. This specific handicraft store is in "Patio Bellavista", which I showed you earlier. So pretty! If I were in that shop, I'd leave it with too much to carry! Chilienne? C'est superbe rencontrer une compatriote ici et surtout une qui aime aussi le francais. Les photos dans tes blogs son excellentes. Bienvenue! nice photo and handicraft info! !